Awesome place. Very nice items. I love this little antique store. This is a surprise box waiting to be opened. From antique custom jewelry to an old tea kettle . My first purchase was a wrought iron an bamboo refurbishment vanity seat for $6.00. Many items since I remain a loyal customer. Best antique shop, you want it they most likely have it or will find you one. Fun quirky things that you don’t find everywhere else. Antique lovers if you haven’t as yet, please visit and be prepared to spend 2 hours like I did. The people are very nice and will help you find specific things if you’re looking. Which is very handy because the place is very large with two floors and multiple rooms on each floor. I can go and spend a couple hours looking through the store! Always love coming to this place. You can find a variety of items at a bargain. You could spend hours just looking! Great little antique shop. Found some really cool things at great prices..Private parking lot is a plus on Main street. I love this place. It’s a one stop shop. Every holiday or birthday of my wife’s can be taken care of in this place. And the people there are wonderful. Always can find something unique for me or as a gift. Always find a great piece at a great price here! Something for everyone! Great variety. Reasonable prices. Spent a fun hour hunting. This is a cool place a little bit off of the beaten trail of Main Street. You have to be careful walking around because you might knock something over. 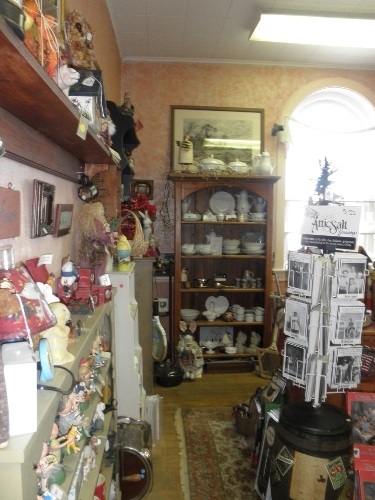 It may look like a small place but they have antiques on multiple floors and there’s tons to look at in each room. love this place and the prices.